Over the years, I’ve explored a number of albums based in the free jazz and/or noise categories, listening to artists whose want of freedom from structure has often manifested itself as cacophonous abstractions via any number of instrumental means. No rules; no order. Such anarchic tendencies seem to contradict the whole notion of creation, that simply acting in the cause for deconstruction might undermine the whole process of making. From this standpoint, though, you figure out that through deconstruction, artists create a new foundation, which allows pattern and form to exist anew in a different, possibly unique, manner of speaking. For all its overt aimlessness, there’s reason; there’s structure. There’s a plan. 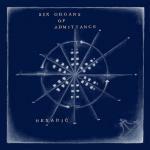 Ben Chasny’s latest Six Organs of Admittance offering Hexadic is based on The Hexadic System, an idea devised by Chasny meant to allow his improvisational ideas to emerge while also aiding in the development of what would seem to potentially result in any number of musical combinations. These combinations he based on poker cards, (six of them, to be exact). So, by that logic: Six Organs + six cards + six strings = Hexad and, therefore, Hexadic. And, there’s the concept. There’s the plan. So developed is this plan that Chasny’s published a book about it, which is illustrated with diagrams and packaged with a deck of cards. It’s like he’s marketing this source of inspiration like Criss Angel markets magic tricks, spelled out so that anyone can do it. When I’d initially read about this system Chasny created, I thought about Captain Beefheart’s songwriting process. Years ago, I read an interview with Beefheart that Lester Bangs had written wherein he’d detailed actually diagraming his songs. With no shortage of free jazz added to albums like Trout Mask Replica and Lick My Decals Off, Baby, this aspect of Beefheart’s work seems, albeit unintentionally, connected to Chasny’s, though Hexadic is much less the ensemble-level statement. Backed by drummer Noel Von Harmonson and bassists Rob Fisk and Charlie Saufley, Chasny pushes his guitar sound, which is an often shrill or searing stream of buzzing metal that cuts through the slow n’ steady trudge of album single Wax Chance, the immediate pulse of Maximum Hexadic or the sporadically spoken vocal of Sphere Path Code C. And while these tracks represent what I consider the album’s best moments, they stand unique amongst the otherwise inconsistent majority of cuts that comprise Hexadic. With his newfound methodology, Chasny develops a mostly inconsistent series of tracks that explore both structured and improvised concepts, which are tied together by the minimalist quartet that performs them. The album’s opening track The Ram attempts to set a precedent by establishing Chasny’s pursuit of randomness and discordance. It’s this discordance that doesn’t jive with Wax Chance, whose howl and churn moves at a snail’s pace and shifts into momentary blasts of motorized speed. This lack of commitment is so inherent throughout the album that it’s difficult to buy into Chasny’s means of inspiration, though I certainly find parallels between some of Chasny’s guitar solos and the oft-abrasive free musicianship of Albert Ayler. Despite this, Hexadic isn’t short of worthwhile moments. I particularly enjoy the Earth-y drone of Hollow River and the Angelo Badalamenti meets DNA blend of Hesitant Grand Light. The closing track, Guild, sounds like Chasny’s attempt at rewriting Funkadelic’s Maggot Brain. For whatever faults lie within the grooves of Hexadic, the cards were at least interestingly dealt.